NASA Earth Observatory images by Joshua Stevens, using Landsat data from the U.S. Geological Survey and soil moisture data courtesy of JPL and the SMAP Science Team. Story by Kasha Patel. Hundreds of thousands of people in eastern Africa have been affected by heavy rains and devastating floods in April and May, especially near the Shebelle and Jubba rivers. Originating in Ethiopia, they are Somalia’s only perennial rivers and serve as fertile plains for crop production. Flooding burst the banks of the Shebelle River in several locations, destroying houses and crops and causing more than 120,000 people to flee their riverside homes since April 2018. 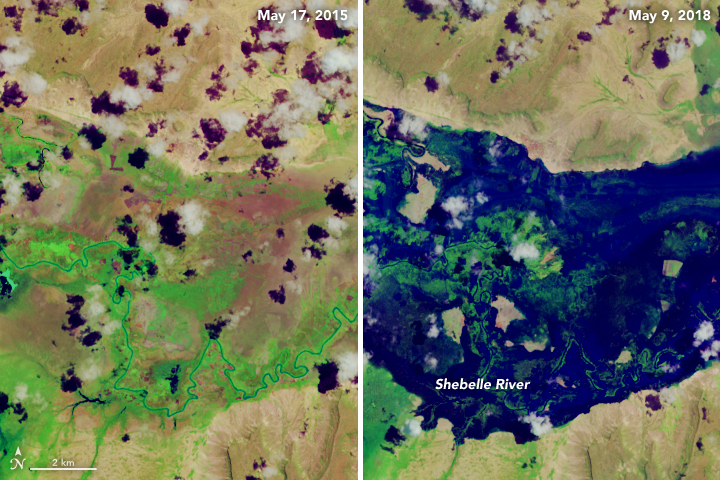 The images above show the Shebelle River on May 17, 2015 (a relatively normal year) and on May 9, 2018. 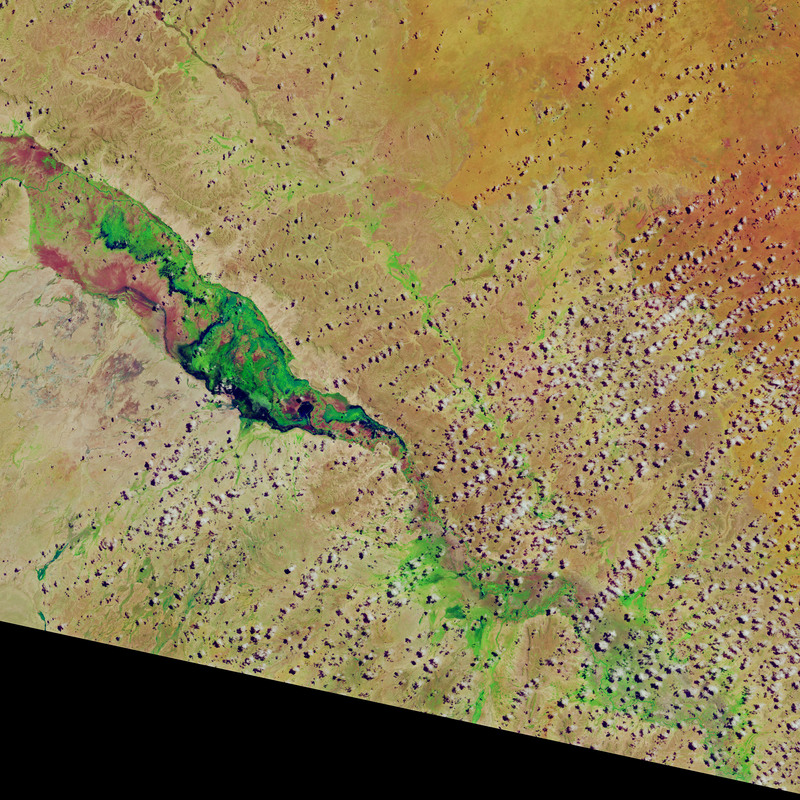 These false-color images (bands 6–5–3) were captured by the Operational Land Imager (OLI) on Landsat 8. The floods are some of the worst on record for the region. Heavy rains are expected to continue through mid-May, which could create more problems in areas where rivers are already at full capacity. 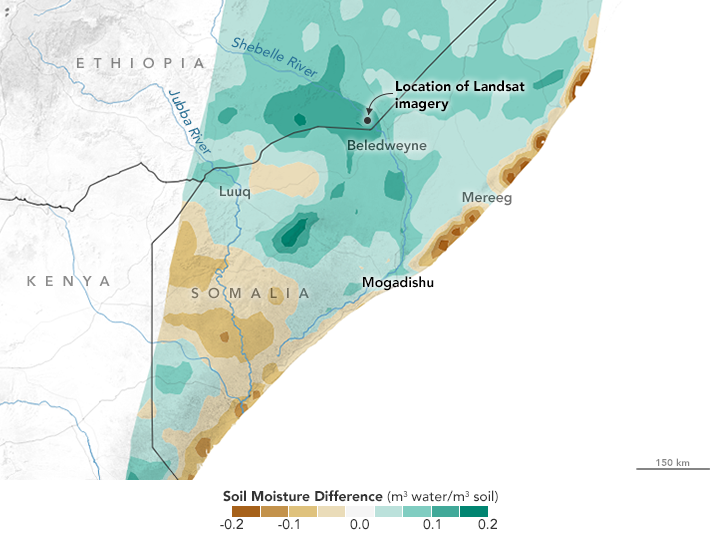 The map below shows the change in soil moisture in Somalia from May 7, 2017, to May 5, 2018. 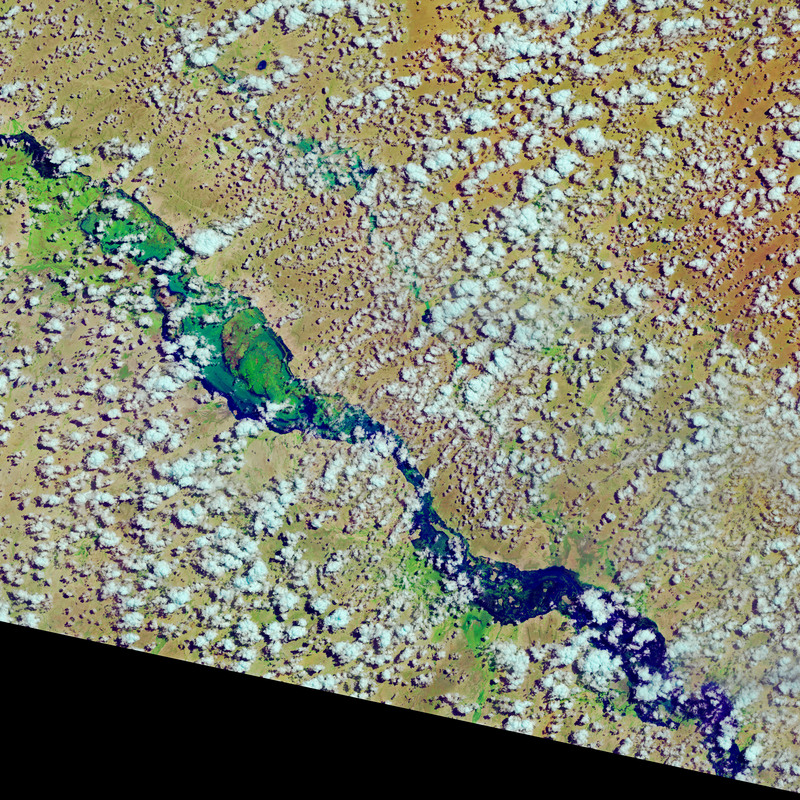 The map was created with data from the Soil Moisture Active Passive (SMAP) satellite, which uses a radiometer to measure moisture in the top 5 centimeters of the ground. Heavy rains also have overwhelmed Kenya, destroying an area of farmland larger than New York City. Floods have washed away bridges and homes, shut down schools, and taken many lives in the past two months. At least 270,000 people have been displaced. The floods are a dramatic and dangerous turnabout for millions of Kenyans still recovering from drought and food insecurity in 2017. ACAPS (2018, May 9) Somalia Flood update 1. Accessed May 9, 2018.
eNews Channel Africa (2018, May 4) Kenya floods leave 112 dead in two months: Red Cross. Accessed May 9, 2018. Food and Agriculture Organization of the United Nations (2018, May 8) Somalia Food Watch Bulletin — Issued 08 May 2018." Accessed May 9, 2018. United Nations News (2018, May 1) Almost 500,000 affected as devastating floods inundate central Somalia—UN mission. Accessed May 9, 2018. World Health Organization (2018, May 8) More than half a million Somalis affected by floods and heavy rainfall. Accessed May 9, 2018.